There are mistakes and misinterpretations of the scientific literature in your recent open letter to Sir Peter Gluckman and Sir David Skeggs. The letter also misrepresents the NZ Fluoridation Review (Eason et al., 2014) and the Fluoride Free NZ (FFNZ) report criticising that review. It gives the latter report more credibility and status than it deserves. I am responding with an open letter of my own because I think the mistakes and misrepresentations need correction. I hope you receive my critique with the respect for the scientific openness, criticism and healthy discussion you assert in the last paragraph of your letter. That certainly describes my approach and in that light I offer you a right of reply on my blog to this open letter. First I consider some aspects of the way you present the NZ Fluoridation Review and the FFNZ report. You generally cite “Health Effect of water fluoridation: A review of the scientific evidence“ (Easton et al., 2014) as the “Gluckman/Skegg report.” I realise you does this because your clients, and particularly the Fluoride Free NZ activist group, have adopted that terminology. It is however disrespectful to the real authors of the review. Such reports are not usually attributed to the heads of institutes or organisations. You unfairly compare Easton et al., (2014) to other major reviews in terms of cost, time taken, processes and the publication period reviewed. You are simply citing the activist FFNZ report which set out to discredit the NZ Fluoridation Review in any way possible. “Several previous rigorous systematic reviews were used as the basis for this analysis, and literature searches in Medline, EMBASE, the Cochrane library database, Scopus, and Web of Science were undertaken to identify subsequent studies in the peer-reviewed scientific literature. Alleged health effects from both the scientific and non-scientific literature were considered, and many original studies relating to these claims were re-analysed.” [My emphasis]. The FFNZ comparison is disingenuous. You promote the inaccurate self-description of the FFNZ report (Scientific and Critical Analysis of the 2014 New Zealand Fluoridation Report) as “international peer reviewed.” That is the impression FFNZ attempts to convey but it is dishonest – all the authors and “peer-reviewers” are connected with, or work for, Paul Connett’s Fluoride Action Network and similar activist organisations in the US or NZ. I illustrate some of the links in the figure below taken from the blog article The farce of a “sciency” anti-fluoride report. I have provided an in-depth analysis and critique of the FFNZ report in a series of blog articles which are available in a single PDF document (Fluoridation is safe and effective: A critique of Fluoride Free NZ’s criticism of The NZ Fluoridation Review). Now, the substantive issues you raise in your open letter. Up front we must be clear about the situations behind the various scientific studies on the issue of fluoride and IQ. The studies you do cite (mainly Choi et al., 2012) are from areas of higher fluoride consumption. Most of the studies were from areas of endemic fluorosis – mainly in China. This means that the findings cannot simply be transferred to areas like NZ. This is why the Choi et al., (2012) meta review is not directly relevant to CWF. Choi et al., (2012) not relevant to CWF. I can illustrate the difference between that situations reviewed by Choi et al., (2012) and the New Zealand situation where CWF is common using dental fluorosis data from the recent paper of Choi et al., (2015), Our Oral Health (2010) and Beltrán-aguilar & Barker (2010) (see Water fluoridation and dental fluorosis – debunking some myths). There is very little severe or moderate dental fluorosis in NZ and USA. But it is very common in the area studied by Choi et al., (2015) which is probably typical of the areas reviewed by Choi et al., (2012) and the Indian paper you cite (Saxena et al., 2012). Unfortunately most of the studies reviewed by Choi et al., (2012) are of poor quality (see below) and do not include data for many possibly confounding factors like severe dental fluorosis, pesticide use, etc.). So – clearly different situations. The metareview of Choi et al (2012) was a metareview of studies from higher fluoride areas – not a metareview of studies from all areas, or studies from areas where CWF is common. Their review is not directly applicable to situations where CWF is considered, like NZ and USA. Note: I have suggested (Perrott 2015) that the small cognitive deficits report by the Choi et al., (2012) could be caused by severe dental fluorosis, and not directly caused by chemical toxicity. (I discuss this further below.) This is consistent with the results of Choi et al., (2015) who observed a significant relationship of cognitive deficits to severe/medium dental fluorosis but did not find a significant relationship with the fluoride concentration of the drinking water. I believe researchers studying IQ effects in areas of endemic fluorosis should consider this hypothesis. Your open letter concentrates mainly on an “error” in the NZ Fluoridation Review. This “error” was little more than a “typo,” occurred only in the executive summary (the body of the review reported the science correctly), and was corrected by the authors when brought to their attention. They also corrected at least one other error at the same time. I have discussed this in Did the Royal Society get it wrong about fluoridation? Any publishing author is well acquainted with the problems of typos and similar errors. Despite the best proof-reading of drafts one inevitably finds some errors only after publication. (An example of Murphy’s Law, I guess.) This error has only become an issue because of the intention of activist organisations who wish to discredit the review. Yet, you, FFNZ and their associates do not criticise Harvard University! Your mistaken description of error. First, I will stress again that discussion of this “error” refers to the work of Choi et al., (2012) and areas where fluorosis is most likely endemic. That research does not deal with CWF or the situations where drinking water fluoride concentrations are that low. The slide below, from a presentation made by Xiang (2014) at Paul Connett’s last conference in Washington, gives an idea of the situation in areas where these studies were made. Xiang is the author of several of the papers reviewed by Choi et al (2012) and commonly used by anti-fluoride activists in arguing against CWF. This is clearly a different situation to New Zealand. What did Choi et al (2012) actually report? They report in their abstract “The standardized weighted mean difference in IQ score between exposed and reference populations was –0.45.” This is a standard deviation resulting from their analysis of 27 studies with different methods and quality of data. It is not a difference in IQ score. This approach was necessary because the different studies reviewed had different IQ scales, different measurement methods and different levels of variation in the data. They standardised the differences by expressing them as a fraction of the standard deviation for each study. A mean value over all studies was determined, weighting the contribution from each study according to the precision of the IQ measurements. Mistakenly, Harvard University and the NZ Review summary originally described this as an IQ score difference instead of SD. (Note – this mistake was not in the body of the NZ Fluoridation Review). In fact many readers were confused as the statistical process used by a Choi et al (2012) was not sufficiently well explained from a lay person’s viewpoint and they had to publish an extra explanation later (Choi et al., 2013). Going from a standardised weighted mean difference value to a difference in IQ points. Standard deviation is a function if variation in data so it is wrong to assume a value for all situations. It will be different for different sets of data. This cannot simply be translated to any other IQ scale. For example these values would be inappropriate for the IQ scale used in Saxena et al., (2012) study you refer to later in your letter. The significance of the 0.45 standard deviation decrease in IQ points. The articles reviewed were in themselves mostly of poor quality, did not consider confounding factors and were often very brief (see figure). Not the fault of Choi et al., (2012) and hardly a surprising situation for the regions of interest, but this does help put the value of 0.45 standard deviation into context. It is, as yet, really only provisional. Your claim the Fluoridation Review misrepresented Choi et al (2012) in a specific quote. This is a valid assessment because the mean difference they observed amounted to only 0.45 of a standard deviation which can be related to measurement error. I really don’t see any misrepresentation there. The authors did note that the difference was small compared with measurement error. You have relied for claims on a metareview of studies from areas of endemic fluorosis. A study reviewing reports of mainly poor quality and which the authors had described as not relevant to areas using CWF. You misrepresent correction of the small mistake as a change in recognition of the science or a “misreading of the available evidence.” There was no change as the science was correctly reported in the body of the review – the mistake occurred only in the summary. Others have made similar mistakes – including Harvard University in their press release. You repeatedly refer to an IQ point differences of 7 without at any time considering how significant this value is compared with the measurement errors. You imply that this issue was not thoroughly addressed, which is wrong as it was discussed in the body of the review. Correction of the mistake in the summary is all that was required. But, I stress again, whatever the significance of the small IQ differences reported for areas with endemic fluorosis in these studies they are not relevant to areas like NZ where no IQ deficits have been reported for CWF. In fact, quite the opposite (Broadbent et al., 2014). You express concern “relevant evidence” was neglected by the authors of the review. 1: Cheng and Lynn (2013) and a study “(referred to by Cheng and Lynn).” However, you do not attempt to explain what this paper contributes. The journal (it is in Mankind Quarterly) is not one normally considered for publishing scientific papers and is extremely difficult to access. My reading of the paper indicates nothing new – in fact it is a repetition of the data from the Choi et al., (2012) paper (which I find strange as it doesn’t even cite that paper). 2: The cross-sectional study by Saxena et al., (2012). I agree this wasn’t included – but then again it is not relevant to CWF. The study considered situations where drinking water F concentration was greater than 1.5 ppm. Unfortunately the images you reproduce could give a misleading impression. The linear plot in your figure was actually for the relationship between urine F concentration and drinking water concentration. The plot for intelligence grade does not look so impressive (see figure). Saxena et al., (2012 ) do show an increase in mean intelligence grade (corresponding to a decrease in IQ) for the increasing concentration ranges. (You should perhaps note your reference to a standard deviation of 15 in such studies is clearly irrelevant to this study). They admit to several limitations in their study. We can agree with their assertion there is a “need for a more careful evaluation of the effect of fluoride on intelligence.” But given the endemic fluorosis in the area they studied, and in the areas of the studies reviewed by Choi et al., (2012) and studied by Choi et al., (2015) I suggest this is only relevant to such areas. I stress – no such IQ differences were observed in areas where CWF is used (Broadbent et al., 2014). I am aware of a number of other studies reporting cognitive deficits in areas of endemic fluorosis – suggesting IQ may well be a topical area of research in such areas. The NZ Fluoridation Review may not have cited these – precisely because they are not relevant to our situation. However, I will reproduce some data from one of them (Sudhir et al., 2009) because it is directly relevant to the next topic. These authors did see increasing cognitive deficits with increasing concentration of F in drinking water. 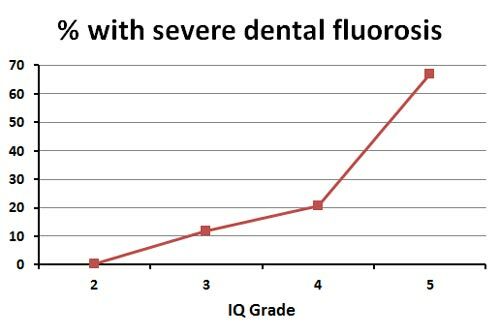 But they also saw a strong relationship between cognitive deficit and severe dental fluorosis (see figure below). I stressed at the beginning of this letter that these IQ studies have all (except for Broadbent et al., 2014) concentrated on areas of endemic fluorosis. Children in these areas show high incidence of severe dental fluorosis and this is quite different to New Zealand (see the second figure in this letter). It is also noteworthy that Choi et al., (2015) chose to extend their work in an area of endemic fluorosis (in a Chinese village) and not an area of the USA where CWF is common. Maybe they recognise this is a problem for areas of endemic fluorosis and not for areas using CWF. Unfortunately researchers like Choi et al., (2015) have limited their working hypothesis only to chemical toxicity. But, dental defects are known to cause decreased quality of life and this could be translated into learning difficulties and reduced IQ scores. In a recent article I suggested these researchers widen their considerations to including the hypothesis that severe dental fluorosis, in itself, could be a cause of cognitive deficits simply because of the effect of physical anomalies and appearance on IQ (see Perrott 2015). 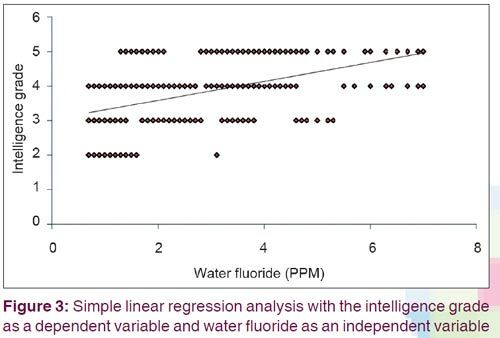 This is, after all, consistent with their findings that cognitive deficits were significantly related to incidence of severe/medium dental fluorosis but not to the F concentration in the drinking water. Other oral defects like bad dental decay are also known to cause a reduced quality of life and may lead to learning problems and cognitive deficits. While severe dental fluorosis is a problem in areas of endemic fluorosis it is not here. I suggest you worry more about possible IQ effects of tooth decay than any due to fluoride in our drinking water. You are just scaremongering with your flight of fancy suggesting that “institutionalizing the additional proportion of the population due to mental deficiency” should be considered as a cost against CWF. One could more sensibly say that in NZ the quality of life and possible cognitive deficits arising from dental decay should be considered as a cost against opposition to CWF. Your letter is part of an ongoing campaign by New Zealand anti-fluoridation activists like FFNZ and New Health NZ to discredit the NZ Fluoridation Review. New Health NZ is part of the NZ Health Trust, a well-funded lobby group for the “natural”/alternative health industry in New Zealand. It campaigns on issues like fluoridation, vaccinations and “chemtrails” (see Who is funding anti-fluoridation High Court action? and Corporate backers of anti-fluoride movement lose in NZ High Court). On the surface your complaint about the mistake in the summary of the NZ Fluoridation review is at least churlish. Especially as it was corrected when brought to the authors’ attention and there was no mistake in the body of the review. Despite the same mistake in the original version of Harvard University’s press release on the research neither you nor your colleagues in the NZ anti-fluoride movement have complained to Harvard University. One would have though the correction of the mistake would have pulled the rug out from under the anti-fluoridation critics but you have unjustly tried to use the original mistake to argue that the authors of the NZ Fluoridation Review misunderstood or misrepresented the science. In fact, the misrepresentation comes from you and your anti-fluoridation colleagues as the study you seem to pin all your arguments on was made in areas of endemic fluorosis, (mainly in China) and has no direct relevance to New Zealand CWF. New Zealand health professionals and members of local bodies should see your complaint for what it is – part of the ongoing activist campaign against CWF. These decision makers are justified in the confidence they have in the NZ Fluoridation Review. Beltrán-aguilar, E. D., & Barker, L. (2010). Prevalence and Severity of Dental Fluorosis in the United States , 1999 – 2004 (pp. 1999–2004). Cheng, H., & Lynn, R. (2013). The adverse effect of fluoride on Children’s intelligence: A systematic review. Mankind Quarterly, 53, 306–347. Choi, A. L., Grandjean, P., Sun, G., & Zhang, Y. (2013). Developmental fluoride neurotoxicity: Choi et al. Respond. Environmental Health Perspectives, 121(3), A70. Eason, C., & Elwood, JM. Seymour, Thomson, WM. Wilson, N. Prendergast, K. (2014). Health effects of water fluoridation : A review of the scientific evidence (p. 74). Hansen, L. (2015). An open letter to the Prime Minister’s Chief Science Advisor and to the President of the Royal Society of New Zealand. Saxena, S., Sahay, A., & Goel, P. (2012). Effect of fluoride exposure on the intelligence of school children in Madhya Pradesh, India. Journal of Neurosciences in Rural Practice, 3(2), 144–9. Sudhir, K. M., Chandu, G. N., Prashant, G. M., & Reddy, V. V. S. (2009). Effect of fluoride exposure on Intelligence Quotient ( IQ ) among 13-15 year old school children of known endemic area of fluorosis , Nalgonda District , Andhra Pradesh . JOURNAL OF THE INDIAN ASSOCIATION OF PUBLIC HEALTH DENTISTRY, 2009(13), 88–94.